Rolanmen1's Mega Man Zero in 17:05 using "warps" or "mission skips". This is an improvement of computerbird's TAS, improved by 747 Frames (12.45 seconds). For those who are interested, at the end the In-Game time is "6:10"
Note: To do the "Warp" you must escape the Find Shuttle mission, wich then unlocks Dual in Desert mision, if you escape in said mission the base will get attacked, thus unlocking the Defend the Base 2 mission without any choice. 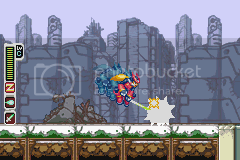 Since this run is done using "Warps", the only weapons being used are the Z-Buster and the Z-Saber. The Z-Saber was leveled up to get the Triple Slash and the Air Rolling Slash, the latter is a must in this run, because how quick it can do some bosses, to get such technique Zero needs to Air slash 100 enemies. Most of the improvement here was by manipulating bosses more accurately, the easiest way to do this is use the Z-Buster at a anywhere before the boss, each bullet can change the bosses moves. 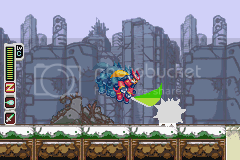 Also, if you are close enough to the ground, you can jump and cancel the second hit and do a third air slash, thus creating a 3 Air Slash Combo, so any enemies with 13 HP can be killed using this (for enemies with more HP you can use the Z-Buster). Also. this move can't be used on enemies above Zero. Anyway, i got 39 Air Slash before Aztec Falcon, so slashing him for the first time unlocks the 2nd slash, thus creating an improvement of 20 frames on this fight. About the Cyber-Elf trick: There is a little trick of using a bird elf on Neo Arcadia Shrine, what such elf does is to carry Zero once he falls on a pit, while it carries Zero you are free to move the elf, doing such trick you can have the luxury of not waiting for one of the platforms to appear, i tested this and it ended being slower by like 50 frames. This trick is only faster in a normal speedrun. Most thanks goes to Computerbird, from his TAS i learned how this game exactly works. Thanks also to Mike Uyama and Elpis-TK31 from SDA for always discussing with me about Megaman Games. Thanks also to Atma and Nitrodon, from them i learned more about the Tool-Asistance mechanism. And also thanks to the TASvideos crew and the guys there on #Tasvideos.